You can't go wrong with jeans and a blazer. This cardigan is cute, but the look is a little messy. Don’t ask me about this title- my 10 year old came up with it! Today I’m wearing jeans, a tank and a blazer. In the picture on the right I am showing the same outfit- but with a long cardigan. While I love this cardigan, it doesn’t seem to do much for this outfit. On the left I switched out the cardigan for a blazer that has a cute ruffle detail on the back. I have a feeling this blazer is going to become one of my favorites. First of all, I bought it at Kohls– so it was cheap. Second, it is made of cotton- so it feels like a sweat shirt (but so much cuter). And finally, I think a blazer paired with jeans is a perfect outfit. It always looks polished, stylish and is comfy. To add some interest, I’m wearing another necklace from Forever 21, and then to top the whole look off, I’m wearing heels. I think every gal should have at least 3 pairs of jeans- 1 skinny pair, 1 weekend pair and 1 that you can wear with heels. The pair I’m wearing today are Paige Premium Denim and I LOVE them! The cut is made for moms- so it comes up high enough in the back (no coin slot). I love the dark wash, the thick waistband (holds the tummy in) and the fabric is stretchy enough to make them comfortable. What are your favorite jeans? Send me a picture! I wonder if a longer necklace would be better? 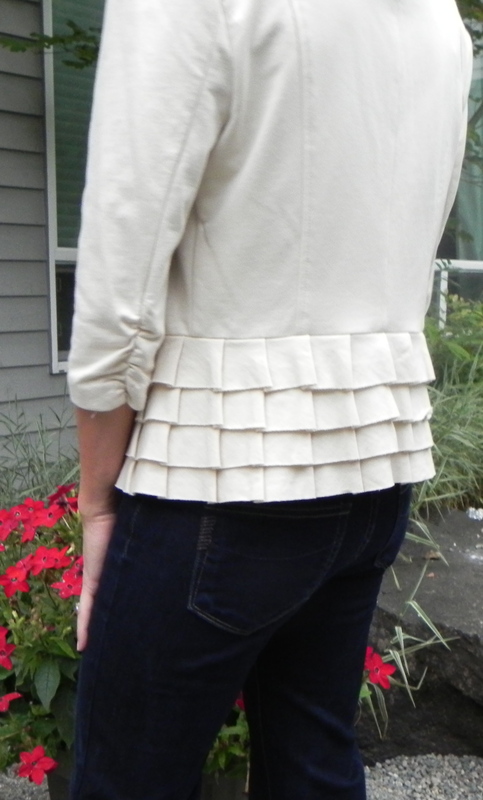 Love the ruffle detail on the back. The blazer is adorable! I might have to run over to Kohl’s right now to pick one up.